Throughout its history, the Korean peninsula has been home to lively, innovative, and sophisticated art-making. Long periods of relative stability have allowed for the establishment of spiritual traditions, societal values, and artisan technologies specific to the region. 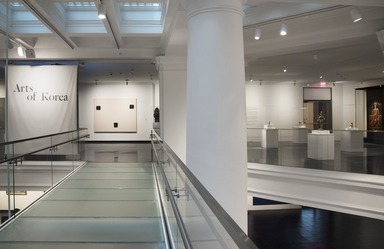 The displays in this gallery are organized by time period. The earliest art objects belong to the Three Kingdoms period (first century B.C.E.–668 C.E. ), when Korea’s elite were buried with large collections of ceramic vessels and jewelry. Buddhism arrived from China in the third century C.E. and began to gain popularity toward the end of this period. The region was unified for the first time under the Silla dynasty (668–935), and both burials and Buddhist monuments became more elaborate and sophisticated. The subsequent reign of the Goryeo dynasty (918–1392) is often cited as the golden age of Korean art patronage because the royal court dedicated considerable expense to the creation of sumptuous and refined works of art for both religious and secular settings. Invasion by the Mongols in 1270 weakened Goryeo rule, and the dynasty struggled until giving way to the Joseon dynasty. The Joseon is one of the world’s longest-ruling dynasties, lasting from 1392 to 1897. Early in this period, elite Koreans adopted Confucianism, setting Buddhism aside as the primary religion of the region. Confucian thought affected every aspect of Korean life, from governance and family structure to aesthetics. From the earliest periods, Koreans have spoken their own language and practiced their own form of shamanist religion, both of which continued to thrive even as literary traditions and religious practices were introduced from China. Korea maintained trade with several neighboring nations until a period of self-imposed isolation that began in the seventeenth century. This isolation, followed by thirty-five years of Japanese occupation, meant that the history of Korean art was little known, even within Korea, until the second half of the twentieth century. 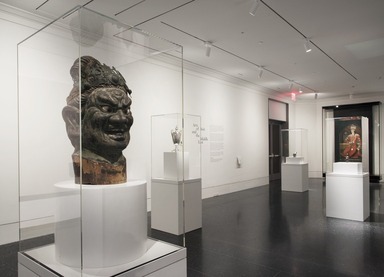 The Brooklyn Museum has been a pioneer in the appreciation and display of Korean art. 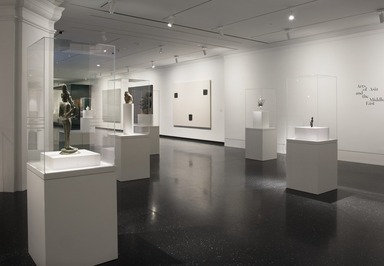 The Museum sent a curator to Korea in 1913 and opened a permanent-collection gallery for Korean art, the first in the continental United States, in 1977. 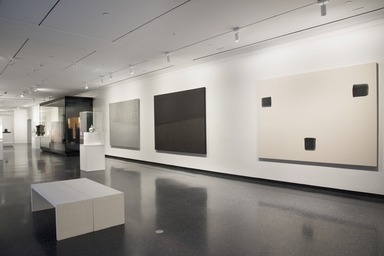 The present gallery, opened in 2017, is triple the size of that first space, allowing the Museum to reiterate its commitment to representing the diversity and elegance of Korean art. 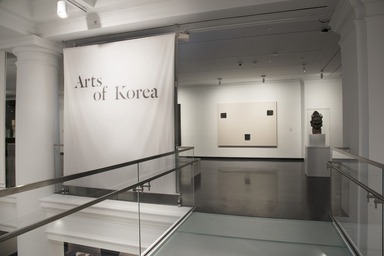 The Arts of Korea gallery is made possible by generous grants from the National Museum of Korea. During the Three Kingdoms period (first century B.C.E.–668 C.E. ), much of Korea was divided into the three warring states of Silla in the southeast, Goguryeo in the north, and Baekje in the southwest. However, significant stretches of territory at the southern end of the peninsula remained independent and were ruled by a group of city-states known as the Gaya confederacy, which played an important role in the dissemination of new ceramic technologies from Korea to Japan. In the seventh century, the Silla kingdom gradually overtook its rivals and Korea entered the Unified Silla period (668–935). In the fifth and sixth centuries, Koreans developed the world’s first high-fired stoneware. Fired to temperatures in excess of 1,000˚C, these ceramics were completely nonporous. They were thrown on a wheel, enabling the potter to give them thin, even walls. The Korean kiln, which probably originated in the Gaya region, consisted of a single large tunnel-like chamber built on the slope of a hill to provide a good draft for the wood-fueled fire. The dark color and lustrous surface on the shoulder of these stoneware vessels are a result of the silica in the wood ash. These ceramics, often in the shape of vessels for food and wine, may have been used in homes, but they were typically found in tombs. Early Korean burial chambers were filled with objects, both utilitarian and luxury goods, that were placed around the coffin and meant to serve the deceased in the afterlife. Such objects were replicas of items used in daily life as well as treasures intended to indicate rank or status. These mortuary practices, similar to ones found in ancient Egypt, entered Korea from China through the Chinese commandery, or colony, of Lelang in northern Korea. The Goryeo dynasty had fully unified the Korean peninsula by 936, and the ensuing period of political stability was one of great flowering in the arts and culture. After initially turning to Chinese exports to satisfy an urge for exquisite objects, the Korean court developed workshops of its own, producing paintings, metalwork, and ceramics that soon rivaled those of the Chinese. Perhaps the greatest achievements of the Goryeo workshops were celadon-glazed ceramics: vessels of such an ethereal blue-green that even Chinese connoisseurs exclaimed about their color. Celadon glaze had existed for centuries, but Korean potters in royally sponsored kilns refined their materials and techniques to create the most delicate forms in the coolest tones. From Chinese tradition they borrowed the practice of carving the clay surface so the green glaze would accumulate in the indentations. But ceramicists also developed a distinctly Korean decorative technique, setting white or black clay into grooves on the vessel surface to create patterns under the transparent glaze. Under Goryeo patronage, Buddhist institutions flourished. In addition to providing support for Buddhist scholarship, the elite furnished Buddhist temples with great quantities of sumptuous trappings that evoked the beauty of the Buddhist paradise. With the advent of the subsequent Joseon dynasty, both the luxurious tastes of the Goryeo rulers and the otherworldly focus of Buddhism would come under fire. Appreciation for Goryeo aesthetics survived primarily in Japan, and a great deal of Goryeo art made its way to Japan through either gifting or plunder. Buncheong is a modern term used to describe ceramics made in Korea in the fifteenth and sixteenth centuries. Although the term refers to a wide variety of wares, most Buncheong can be identified by its use of white slip (liquid clay) decoration, usually manipulated by the ceramicist to contrast with the gray clay of the vessel body. The appeal of Buncheong wares often lies in their handmade, somewhat rough-hewn quality: whereas the celadons of the Goryeo period are exquisite in their refinement, Buncheong ceramics are often very personal and improvisational. When the Goryeo dynasty fell in the late fourteenth century, a new dynasty, the Joseon, assumed leadership of the Korean peninsula. Early ceramic wares made for the Joseon elite emulated the celadon-glazed, inlay-decorated ceramics of the preceding dynasty. Soon the Joseon court shifted its ceramic consumption to Korean-made porcelains, leaving the Buncheong-producing kilns to nonaristocratic clients. As inlaid decoration fell out of favor, regional Buncheong kilns developed alternative decorating techniques, including sgraffito (scratched) patterns and underglaze iron-brown decoration. Most of these wares share an almost casual aesthetic in which utilitarian vessel forms are enlivened by playful, gestural patterns. Many are covered in a transparent celadon glaze, but with the loose application of white slip and iron-brown decoration, the effect is strikingly different from that of Goryeo-period celadons. Porcelain is a white (or nearly white) ceramic that can achieve a greater delicacy, hardness, and transparency than other ceramics when fired at very high temperatures. Korea began to create porcelain during the Goryeo dynasty (918–1392), several centuries after the Chinese but well before the Japanese, who actually kidnapped Korean ceramicists in the late sixteenth century in order to learn the secrets of porcelain manufacture. Porcelain did not become the ceramic of choice among Korea’s elite until the fifteenth century, when government-run kilns began to produce white wares specifically for court use. Rules reserving porcelain for the aristocracy loosened over time, and by the eighteenth century kiln sites were producing large quantities of porcelain for wealthy households of various ranks. Porcelain was used primarily for presentation and storage of foodstuffs, for desk accoutrements, and for display, whereas metal dishes were favored for tableware. Unlike their Chinese contemporaries, who made enormous quantities of porcelain for export, the Koreans made porcelain mostly for domestic consumption. As a result, their wares strongly reflect Korean tastes: vessel shapes are simply elegant, without carved or applied decoration, and motifs are often rendered in loose, gestural strokes with quite a bit of empty space left on the vessel surface. A Korean taste for aesthetic restraint and natural tones meant that Korean ceramicists did not produce the brightly colored glazes or enameled wares that became so popular in Qing-dynasty China. Instead, they relied on underglaze decorations in iron brown, cobalt blue, and (occasionally) copper red. For the five hundred years of its rule, the Joseon dynasty promoted Confucianism as the official religion and guiding ethos of the Korean nation. Under Confucianism, indulgence in frivolous luxury was strongly discouraged and men in particular were expected to adopt a very restrained style in both personal garments and home furnishings. However, for the official ceremonies and regalia of the royal court, a degree of pomp and beauty was deemed appropriate. The items displayed in this case would have been worn or used by men of the yangban, or aristocratic, class, who served as military and government officials. All of these men would have received their education in Confucian academies, and as civil servants they were expected to maintain the social and political order set out in Confucian and Neo-Confucian teachings. In these teachings, the government is a macrocosm of the family, with the king and queen serving as the esteemed parents of the nation, and the previous royal families serving as its hallowed ancestors. Both government and military men were required to participate in a busy schedule of court rituals that celebrated the Confucian social order and were expected to conduct smaller ancestral rituals at home. In the strict social order dictated by Joseon-period Confucianism, women led lives that were almost entirely separate from those of men. The homes of wealthy Koreans were designed to allow men and women to entertain visitors of their own gender without ever interacting or even seeing each other. In addition to a division of labor—women took care of the home and children while men pursued public roles and engaged in lifelong scholarship—Korean domestic life witnessed a division of aesthetics. While the men’s quarters were sparsely equipped with simply finished wood furniture and paintings with strong didactic messages, the women’s quarters could be decorated with bright embroidered pillows, elaborately inlaid cabinetry, and paintings bursting with birds and flowers. Because furnishings made for women were so much more decorative, Western museums—including the Brooklyn Museum—often collected them, neglecting the more staid and minimalist pieces that were designated for men. It is only in more recent history that Western collectors have come to understand that male connoisseurs would have rejected the ornament of women’s furnishings as frivolous and distracting. 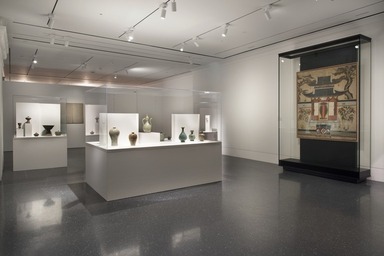 In addition to the pieces that would have graced the rooms where women lived, this display includes several objects that relate to traditional Korean wedding ceremonies. Weddings were a major rite of passage, especially for women, who had to leave their own families to join the husband’s household. As in so many cultures, weddings gave the bride a brief taste of aristocracy, allowing her to dress and be served like a princess before returning to the realities of daily life. The Brooklyn Museum is pleased to unveil Arts of Korea, a celebration of the Museum’s historic Korean collection and a preview of the future Arts of Asia and the Middle East galleries. 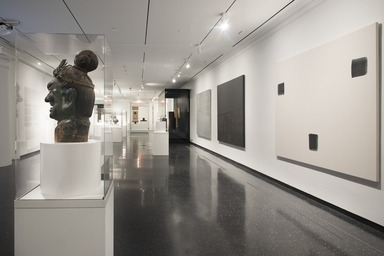 The renovated Arts of Korea gallery is triple its original size and will display more than three times the amount of artworks and objects, many of which will be on view for the first time or after multiple decades in storage. Arts of Korea opens September 15, 2017, and is made possible by generous support from the National Museum of Korea. 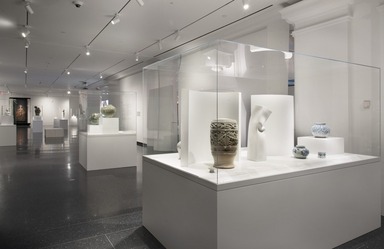 A pioneer in the collection and display of Korean art, the Brooklyn Museum has amassed one of the country’s premier Korean collections and was one of the first museums in the United States to establish a permanent Korean art gallery. Arts of Korea presents 80 works of art, including a stunning selection of ceramics—from early stoneware funerary vessels and inlaid celadons to later wares with freely painted underglaze decoration—and rare examples of metalwork, furniture, painting, jewelry, and costume. Arts of Korea presents 1,800 years of the region’s varied and distinctive art-making through highlighted artworks and objects, including a twelfth-century Ewer in the Shape of a Lotus Bud, considered one of the world’s finest Korean ceramics on account of its delicate modeling and restrained decoration; a recent curatorial discovery of an extremely rare early nineteenth-century wide-brimmed Official’s Hat for Ceremonial Occasions, later banned for its extravagant scale; and an elaborate sixth-century Pair of Earrings that demonstrates the diffusion of art-making techniques across the Silk Road trade routes that connected East and West. In addition, a heavily embroidered cloak worn by nineteenth-century Korean brides, called a hwalot, will be on view for the first time since its acquisition in 1927 after undergoing extensive conservation treatments. In addition to Arts of Korea, visitors will have the opportunity to preview signature works from the anticipated reinstallation of the Arts of Asia and the Middle East galleries on the Museum’s renovated second floor. 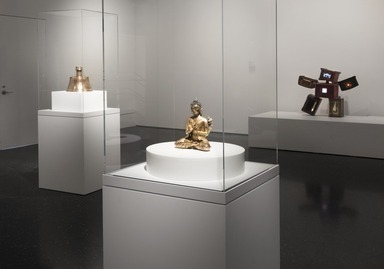 Those masterworks include an exquisite bronze animal-form wine vessel of China’s Shang dynasty (thirteenth to eleventh century BCE); a sixth-century sandstone head from Cambodia; a highly prized bronze icon of the Hindu god Shiva as Chandrashekhara (circa 970 CE); a glowering, larger than life-size head of a Japanese guardian figure; a wonderfully preserved thirteenth-century image of a seated Maitreya from Tibet; an inlaid brass candlestick from the Middle East; a large portrait of an Iranian prince from the Qajar Dynasty of Iran; and a Georgian-style silver urn made by a Cantonese master. 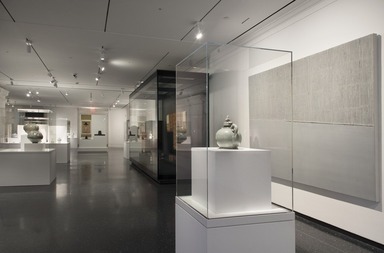 Arts of Korea is organized by Joan Cummins, Lisa and Bernard Selz Senior Curator of Asian Art, and Susan L. Beningson, Assistant Curator of Asian Art. The reinstallation of the Korea collection was made possible by three generous grants from the National Museum of Korea. The Museum’s Arts of Asia and the Middle East collection consists of nearly 20,000 objects, including works considered among the most significant examples of the creative and artistic achievement of the regions. Once reinstalled, the renovated galleries will both celebrate the diversity that has long existed within all of the nations of the continent and demonstrate the exchange of goods and ideas across national boundaries. 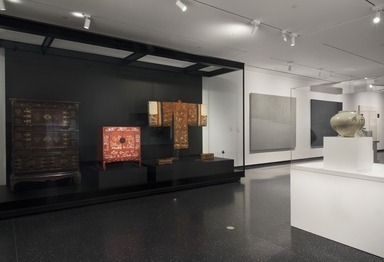 In addition to Arts of Korea, the display of the Arts of Asia and the Middle East collection will include galleries devoted to Arts of Japan; Arts of China; Arts of South Asia; Arts of Buddhism; Arts of Southeast Asia; Arts of the Himalayas; Arts of Asian Trade Routes; and Arts of the Middle East.